A well-built, pro-quality head packed with realistic amp sounds. Superb sounds with stacks of real headroom. Seamless integration with BIAS Amp. Live potential via 600W Class D power amp. No front panel display hampers direct edit/store operation. No built-in effects. The BIAS Head is a massive 600-watt Class D power amplifier that ensures every nuance of your performance is heard on any size of stage, all at zero latency. The head itself comes in a compact, smart and eye-catching steel cabinet with two rows of knobs. The lower row contains familiar gain, EQ and master volume controls, while the upper row takes you into the essentials of the BIAS Amp plugin, with a choice of up to 25 Tone Matched amplifiers, plus controls that govern the number of virtual gain stages, amp topology (single-ended, push-pull, etc), power amp drive, cabinet simulation and a custom control that can be used for any parameter. Around the back, there are two pairs of balanced and unbalanced stereo line outputs, together with a single speaker jack, headphones socket, trio of MIDI sockets, effects loop and two footswitch jacks, together with a USB jack for connecting the BIAS Head to your desktop and a wireless switch when using the BIAS Head with the iPad BIAS Amp app over Bluetooth. It's all built to a very high standard that should inspire confidence, whether in the studio or on stage. The BIAS Head comes with 25 pre-loaded models covering everything from ethereal, glassy cleans, through bluesy, touch-sensitive medium gain to the thickest distortion you can possibly imagine. Even without connecting the software, you can make a host of tweaks from the front panel, including varying the number of gain stages and changing the amp topology. The sound quality is very good, with a level of realism and dynamic response that few modelling products can match. Hook up the BIAS Head to a computer using the BIAS Amp Pro software and there's a practically infinite number of amp models available through Positive Grid's ToneCloud portal, as well as the option to create your own from scratch, meaning there's effectively no limit to what you can do with the BIAS Head. The Amp Match function is a case in point, which is straightforward and fuss-free to use. Generally, the better the source and the more time and effort put into mic positioning and damping, the better the result. It goes without saying that many of the BIAS Head's best-sounding models were recorded in pro studios, but you can still get scarily realistic results with a decent condenser or ribbon mic, which, to all intents and purposes, are indistinguishable from the real thing - a reminder of just how far this technology has come in the past few years, as well as a clear signal of where it's headed. Onscreen, the included BIAS Amp software is very easy and intuitive to use, with beautifully rendered graphics and smooth movements of all controls that replicate on the Head almost instantly. It's easy to see why BIAS Amp has become so popular; it has cross-platform compatibility and it's great fun to use, as well as providing some exceptionally accurate amp models. Aimed at pro players and recording enthusiasts, the BIAS Head is certainly built to handle the onslaught of non-stop touring. There are no built-in effects, which is the most obvious disadvantage, although you can use MIDI to control any external processor. Also, the BIAS Head has no onboard displays to help with editing, so you're limited to the front panel controls and whatever models you assign to the built-in memory slots. That said, hooking up the app from an iPhone is as easy as falling off a log and works perfectly. 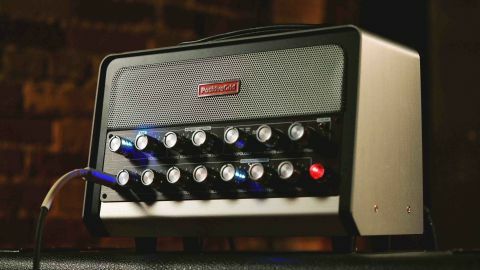 There's no doubt amps like this are the future for electric guitar; maintaining a collection of real valve amps is hard enough, let alone taking them all out to a gig. By comparison, the BIAS Head puts 25 amp models at your toes for immediate access, with an almost infinite range of possibilities.